There is a shocking rise in animal cruelty and that includes the horrifying Yulin Dog Meat Festival in China wherein thousands of stolen pets are slaughtered. What we didn’t know is, it isn’t just the dogs that suffers such cruel acts but also the poor cats as they are tortured and cooked alive. The most popular meat in Guangdong is “Cat meat” because it is a bestseller for Cantonese people (Lingnan cuisine). Cat eating started in the Chaozhou-Shantou region. They believe that eating cats will help balance yin and yang qualities. In fact, there is a cat meat dish called ‘Long Hu Dou’ or ‘Dragon Fighting Tiger’ that they believe has several health benefits. Guangdong Province is responsible for much of China’s horrendous dog and cat meat trade. It accounts for 70% of the dog meat trade and 80% of the cat meat trade in China. That’s about 4 million dogs and 2 million cats. There are established laws in Guangdong against selling dogs and cats for consumption yet these laws are blatantly ignored. Warning: Images and details in this post may be graphic. “Boiled alive cats” are being served in restaurants in Guangzhou, China. 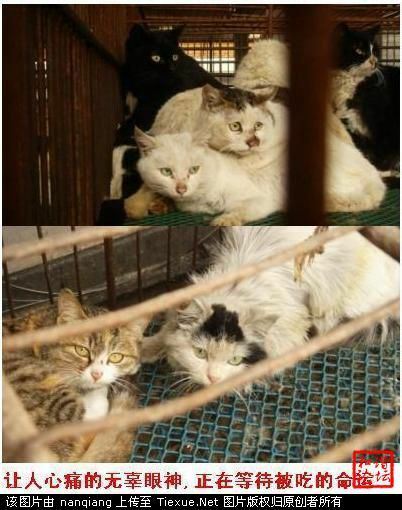 Thousands of stray cats inside cages are being sold in a market in Guangdong. Cat meat costs 20 yuan(approximately $3) per kilogram, while the brain and intestines cost $10 and $16 per kilogram. The preparation process starts with the cook removing its fur. The cat along with the fur is displayed in public to show its high quality and weight. The cat will be boiled while it is still alive. Then the cook will remove the cat’s internal organs and it is ready to cook. What they are doing to these poor animals is horrific. Killing a cat is one thing, but abusing it to death is excessive. Please forward this report and write your comments below.